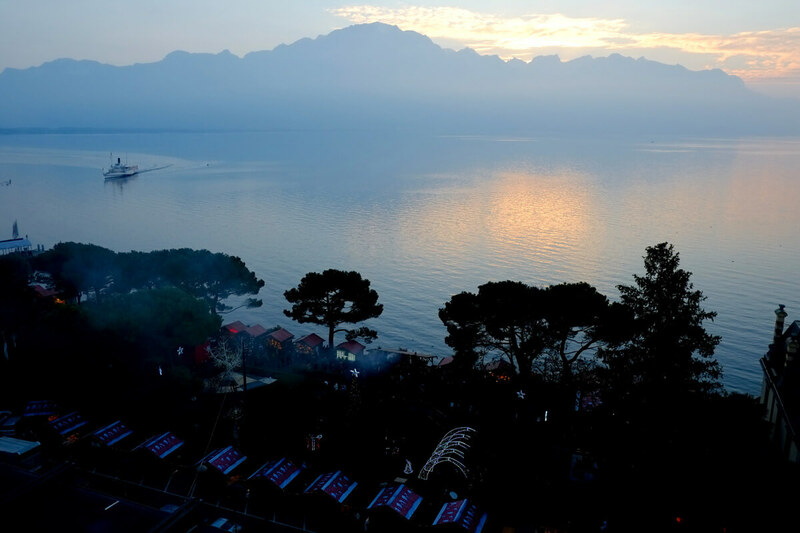 Nestled at one end of "croissant-shaped" Lake Geneva, Montreux is a glittering jewel of a town, and the ideal weekend escape during the holiday season. With history, charm, and joie-de-vivre, all set against a breathtaking backdrop of Alps, it is a place with a signature spirit all of its own. I traveled down by train in a GoldenPass Classic rail car, straight out of the Belle Époque. 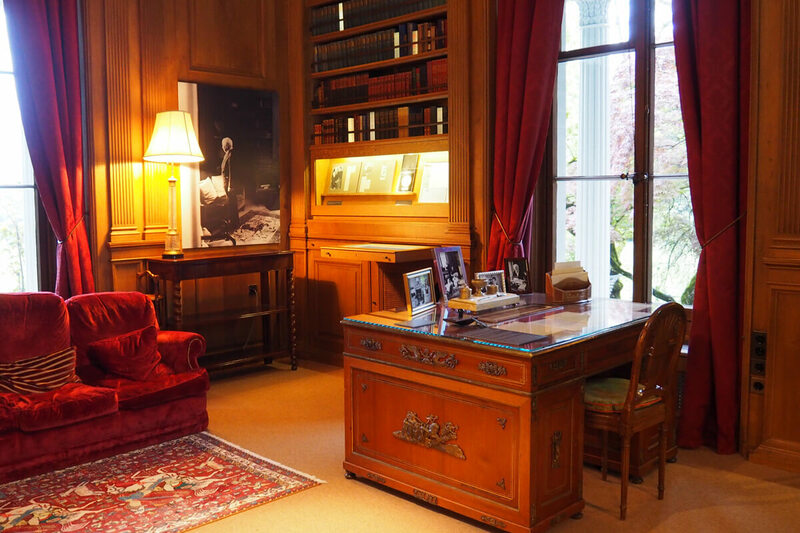 Feeling as if I was a literary time-traveler, I was primed to discover the history of Montreux and its arts-and-literary legacy. Picturesque and with a French flair, you can enjoy sugared cinnamon waffles and other holiday treats while drinking spiced tea with rum, all on the banks of Lake Geneva. A stroll by the water is incredibly beautiful, and it reminded me of why Mary Shelley called the lake "blue as the heavens which it reflects." While Mary and Percy Shelley were here, they stayed with the famed rapscallion-in-exile Lord Byron. Discover the inspiration behind Byron's famous poem, "The Prisoner of Chillon", and tour the fortress castle as it is decked out for the winter season. You are certain to feel immersed in the history of Savoys, Bernese and Vaudois. I was lucky enough to catch the castle at sunset — an unparalleled time for phantasmagoric appeal. In Byron's words: "I have traversed all of Rousseau's ground... and I am struck to a degree with the force and accuracy of his descriptions, and the beauty of their reality: Meillerie, Clarens, Vevey, and the Château de Chillon are places of which I shall say little, because all I could say must fall short of the impressions they stamp." Go back in time with classic Chaplin films, jump into the set yourself, and discover the home he lived in and loved. Packed with authentic memorabilia and stories, this museum is a rare gem, as was Chaplin himself. Here, I had the chance to tour his home and gardens, as well as view some classic cinematic clips that have made an indelible mark on empathy and storytelling in film. It is no wonder that Chaplin was also a human rights activist, a self-proclaimed "peace-monger", and a beloved artist who received the longest standing ovation in the history of the Academy Awards (12 minutes at the 1977 Oscars, for the record!). This summit vista is a true winter wonderland, with hiking trails, marmots, and soaring birds galore. While I liked to travel a truly psychedelic tunnel leading to Santa's mountaintop studio cave of sorts, my favorite part of the journey was definitely the hike that traversed the peaks, following a steep route down into a clouded valley. With birds arcing and gliding around me and the sun warming my face, it made for a surreal and sublime trek. I am certain this is part of why artists find this land one that perfectly complements existentialism. More on this to come! Montreux is certainly a city where love blooms, whether in the form of Gothic romance or courtly allure. I stayed in the luxurious Grand Hôtel Swiss Majestic for a dazzling view, historical appeal, and a feeling of timeless romance. The hotel has exquisite stained glass windows and decor, plus wrought-iron balconies that give the lake view added charm. There is also a renowned restaurant, "Le 45", with something to suit every whim, plus a roof-level exercise room with sauna and steam room. While they might not hearken back to the time of Shelley and Byron - I enjoyed these modern amenities! The Montreux Riviera region offers delights around every gorgeous corner. It reminded me, after all, to stop and appreciate the view, imagining how it certainly inspired creative luminaries throughout the ages. Stay tuned for more details about Frankenstein and Mary Shelley in the Lake Geneva region. Caitlin is a creative collaborator with a curiosity driven mindset. As the founder of MindWise, she teaches about learning, mindfulness, leadership, technology, writing and immersive media.